When it comes to selecting the emergency jump starter, there are a few criteria that separate it from, say, a garage jump starter used by mechanics on a regular basis. “Emergency” would suggest that the intended use is a one off, unexpected use, as opposed to a jump starter used in a garage to start a troublesome car, or on a garage forecourt regularly used to start used cars that have been sitting a little too long. These are two very different circumstances that require a different type of jump starter. So, for the unexpected emergency situation, what is the best jump starter? Let’s examine the criteria for such a jump starter against the two main types, lithium ion and lead acid. So we can see right away that an lithium ion jump starter has a few important advantages over a conventional lead acid jump starter when it comes to an emergency situation. Let’s break it down and look at probably the most important consideration when selecting an emergency jump starter – portability. In all of our lithium ion jump starter reviews, you see one word in each, ultra-portable. What does this mean? It means that not only is the device easy to store, fitting in a glove box, or storage compartment, it means that it is also easy to handle, to remove from storage, setup in the engine bay, and operate without any heavy lifting. Which of these would you rather carry around and pull out in a hurry? This is the Clore JNC660 and the Lithium Ion Powerall side by side to give you an approximation of the difference in size, I know which one I’d rather pull out, considering one is 18 pounds and the other is less than one pound in weight! 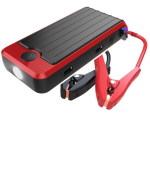 In this particular comparison the price is also in favour of the light lithium ion Powerall as it generally retails for under $100 while the JNC600 retails at well over $100. 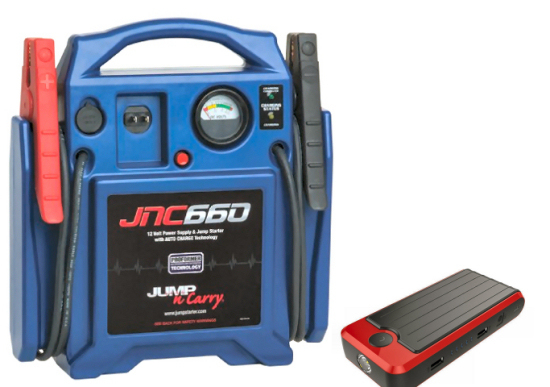 You can check the latest prices and deals on these two jump starters here. So, in an emergency you are going to need a light right? Either to help you hook up the clamps to the correct battery terminals when the light is fading, or to act as a warning light by flashing to traffic that may be approaching. You can see the light illuminated in the above photo of the Powerall. The advantage of the lithium ion jump starter is that it can be held exactly as you would hold a torch, ie. point and shoot, or more precisely, point and light! Some lead acid starters do have a light included, however this is not as handy in a large unit such as that. So, the we are agreed that the best possible emergency jump starter is a Lithium Ion jump starter, but which of the top 3 lithium ion jump starters is really the best for an emergency situation? PowerAll? Brightech Scorpion? PowerGo? We actually find it hard to separate between the three as they are all very good at what they do and they are all very small. If you have a question on any of these, or have used one and can comment on your experience, please post in the comments below!